Before you call employees in for a pre-termination interview, you have some decisions to make about notice, pay, and benefits. You also need to know the laws and regulations involved in these decisions and payments to terminated employees. These provisions also apply to payroll and benefits issues if an employee quits. First, hire an employment attorney to help you deal with the legal aspects and explain relevant laws in your state. Your attorney can help you review your employee policies and draft documents, like the "reason for termination" letter" described below. If you have an employee handbook or policies manual that all employees receive, review this document. Make sure you are following your written policies in the pay and benefits topics listed below. In most circumstances, unless you have a specific notification period in your employee policies, you don't need to give an employee any notice of termination or layoff. Federal labor laws don't include any requirement for notification of termination or that you state a reason for the termination. If the termination is part of a plant closing or mass layoff, you may be required to give a specific amount of notice in accordance with the Worker Adjustment and Retraining Notification Act WARN, a federal law. Some states require that you provide advance notification of termination and some include the requirement that you give a written reason for the termination. Many companies pay employees for time off, in the form of holiday pay, vacation pay, and sick pay. Sometimes these payments (other than holiday pay) are lumped into one annual amount of Paid Time Off (PTO). Employees who have unused paid time off (vacation pay or sick time or general PTO) must be paid for this time unless you have a company policy that limits the amount of payment for this unused time. There is no federal law that requires payment for unused PTO, but your state may have laws that require this payment; these state laws would override your company policy. Severance pay is an amount provided to an employee who is being terminated. The amount of severance is often determined by the employee's length service; a week's pay for under 5 years, 2 weeks for 5 to 10 years, etc. Unless an employee has been given an employment contract that specifies payment of severance pay, there is no federal law requiring your company to give severance pay. If you decide to give terminated employees severance pay, make sure you don't discriminate in favor of highly paid employees. It's also a good idea to get a release form signed by the employee to protect you against any future claims. 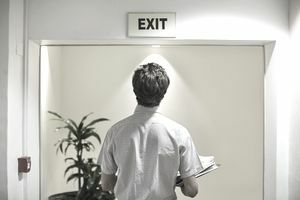 Your employment attorney can help you with this part of the termination process. Federal law doesn't require that you give terminated employees a final paycheck immediately. Some states require you to give the final paycheck immediately, some on the next scheduled payday. In some states, the timing of the final paycheck depends on the reason for the termination (quitting vs. firing). If the employee being terminated is in a retirement plan sponsored by your company, you will need to provide information on how whether the person has a vested benefit and how the person can deal with benefits in the plan. If the plan is a 401(k) or another specific retirement plan, your job as an employer is to give information to the employee so he or she can contact the plan administrator to discuss options. Most employer-sponsored health plans end when the employee is terminated. By federal law, you must talk with these terminated employees about their options for continuing coverage for a period of time. You must include the option for the employee to sign up for COBRA coverage, which the employee pays for. Terminated employees may also be eligible to sign up for a plan on the Affordable Care Act (Obamacare) system. Unemployment Benefits: Depending on the reason for the termination, a terminated employee may be eligible for unemployment benefits. You don't have to pay these benefits directly, but the claim goes against your unemployment insurance account. Any terminated employee can file an unemployment benefits claim, but you have the right to defend against the claim and present evidence that the employee is not eligible for these benefits. This is another time when your employment attorney's help will be important. Termination After Family Medical Leave Act: If an employee quits or is terminated directly after being on leave due to provisions of the Family Medical Leave Act (FMLA), some special circumstances apply. The Department of Labor's FMLA guide gives you information about pay and benefits in this case.